Curls look angelic and so flirty, but the truth is that they can be a real disaster if you happen to have a wrong haircut. You will have to spend hours on styling and the curls will be running to all sides no matter your efforts. That is why I want to introduce here curly shag haircut ideas. Shag haircuts will fit any hair length and will make the styling process much easier, thus making your life easier. Curly shag haircut will allow you to show off your curls with minimal efforts and yet you will be in trends. Let's have a look now. This curly bob haircut is shaggy as you see, but it perfectly maintains the shape of a classy bob with shorter back part and some layers. Smashing hairstyle, right? Long shag haircut with highlights and lowlights can turn into a real masterpiece with this smart layers and curls. Owners of thin hair should love shag bob haircuts as they incredibly add volume to hair and the flirty flicks all around only make the short curly hairstyle more attractive. 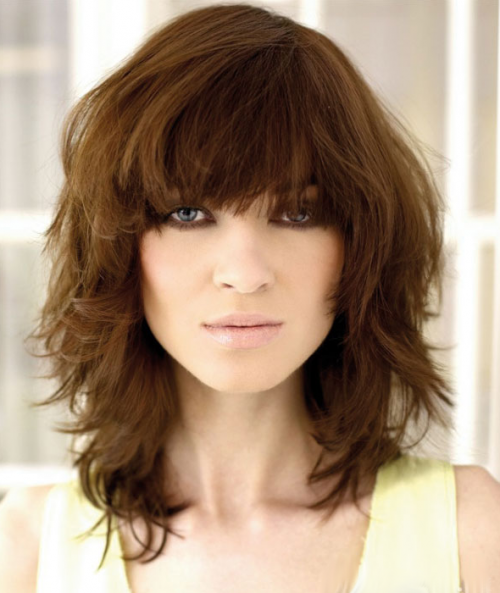 Curly shag bob on the picture below looks very elegant thought it is shag and kind of messy. But the final touch of deep side parting takes the major curls to one side and hides the part of cheeks gently making the short curly hairstyle very feminine. Shag haircuts are best of all created on hair that have natural tendency to being curly. As soon as we hear about short shag hairstyles we imagine such shattered messy style, with layers and long side bangs and all in natural curls.